For some it is as simple as shipping them off to the grandparents but if that is not your case not then I have a few suggestions to make the time count and still have fun. Think about it. The school year is not over so this break time is a prime opportunity to combine learning and fun. Take advantage of the time to encourage learning about other places, people and things. Share unique activities with your kids (or grandkids) and have fun. The “what” is not as important as the sharing of time learning together. 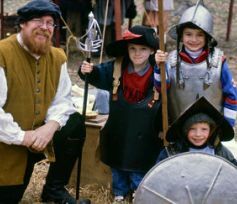 For example I like the exceptional 17th century living history recreated at Henricus Historical Park near Richmond, Virginia and they have added history and conservation tours along the James River on Discovery Barge II. Combine that with the new Children’s Garden at Lewis Ginter Botanical Garden complete with tree house and international village. Southern California has oodles of possibilities. I like Shark Lagoon Nights at Aquarium of the Pacific in Long Beach. The free Friday night activity includes the chance to touch bamboo sharks and see large sand tiger sharks feeding. Combine that with a kayaking adventure on Alamitos Bay with Kayaks on the Water. I like Pigeon Forge and Dollywood’s annual Festival of Nations because it’s a chance to have fun and share interesting cultures without the hassle of TSA. Combine that with a few hours of hiking in Great Smokey Mountains National Park or horseback riding near Cades Cove. Wait for it! If rollercoasters make your family happy, you need to know that Dollywood will literally launch “Wild Eagle” on March 24, 2012. It will define flying free. Checkout Chicago’s Museum of Science and Industry and share The Science of Storms exhibit with your kids. It will be memorable. Combine that with time Lincoln Park Zoo. It’s free and open every day. Better yet checkout the pre-planned urban adventures available with a CityPASS. Share great museums in world-class cities and enjoy substantial savings and avoid long lines. All the fun is included. Need more spring break ideas? Click here.